This compact sports car is all about you and having fast fun. From the moment the Audi TT RS Coupe was launched, the hype started to grow around just how fast this compact sports car would be. And some of the road test data coming out from overseas suggested that the TT RS, would hit 100km/h in less the 3.5 seconds, which is quicker than the already very fast claimed time of 3.7 seconds from Audi themselves. I even thought that maybe, just maybe, it could be because the RS3 Sedan I tested earlier this year went to 100km/h in 3.83 seconds, and that was quite a bit quicker than its claimed time of 4.1 seconds. But when you start to think about these times, you realise that the TT RS, although lighter than the RS3 Sedan, would then go quicker than cars like the Porsche 911 GTS and Nissan GT-R, that cost more than double the R963 000 basic asking price of the Audi. After a run or four, making full use of the seven-speed S tronic’s launch control feature, my test TT RS ran a quick 3,79 seconds to 100 km/h, hit the 1/4 mile in 11,97 seconds at 193,76 km/h, and crossed the 1km mark at 247,14 km/h. Now this is proper fast, and just about right as claimed, but not quite what the world was expecting. So, I thought a few quick notes explaining things might help a little. The TT RS is slightly quicker to 100km/h than the RS3 Sedan, and it stays ahead from there too, but it is slightly slower just off the line, 0-20km/h, 0-40km/h and 0-60km/h, due to the launch control of the TT not being as aggressive as that of the Sedan, and then it makes back the ground it loses. Also, the TT RS as tested came with the 20-inch optional wheels, and I feel that this also held the car back a fraction, as wheelspin is not an issue, and it certainly wasn’t on the Sedan that ran on the smaller 19-inch wheels. There is too much tyre for the car in my opinion. 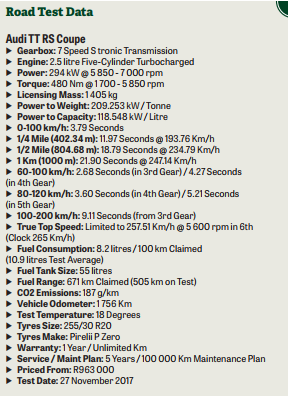 And the Sedan was tested at 8 degrees and the TT at 18 degrees. So, as much as I am happy that on the day, with this car, in this trim, these are the times it can run. I went and did a bit of internet digging around, and had a good look at the numbers posted, and it quickly became obvious that they were doing something different to me when it came to road testing. A car’s ability to launch hard is measured in how quick it gets off the line and covers the first few metres of tar. Just like a pukka drag car does at a drag strip. And because drag racing is so much bigger overseas than it is here, they seem to base their testing as if they were at a drag strip not on a public road. Whereas we in South Africa, seem to earn most of our bragging rights on the streets in our street cars. And this is all about how quick your car is versus another car, without having to deal with the complication of staging, or positioning, your car’s front wheels between the two light beams that are around one-foot apart, for the Christmas (countdown) tree to activate. This means that your car could move for a good few cm before you break the second beam and start the timing of your run, but by then, your car is already accelerating, and this makes a bigger difference than you think versus measuring a car’s acceleration from the moment it moves. So, I did a run with the 1 foot roll out function switched on for my own sanity, which means that my VBOX only starts recording data after 30cm, basically simulating a drag strip start. The 0-40km/h time achieved like this with the overseas guys was around one second, whereas a quick car tested by myself, from the moment it moves, only gets to 20km/h in just under one second, and in the case of the TT RS, it hit 40km/h in 1.41 seconds. And when you look at this difference, you will understand how I then hit 100km/h in 3.35 seconds and the 1/4 mile in 11,49 seconds doing it their way. But this is not how I test, nor is it the way the motor manufacturers test their cars. A car like the Audi TT RS Coupe is very much about the numbers and the performance, it is a selfish indulgence for those that can afford it and want the bragging rights that come with owning a car like this. But anyway, enough of the technical stuff, what else do you get for your money, besides the 2.5-litre TFSI five-cylinder that produces 294kW of angry sounding power, along with 480Nm of torque? You get a lighter car, with razor sharp handling thanks to progressive RS specific tuned steering and RS sports suspension. Long gone are the days of Audi RS cars simply understeering every time a corner was thought about. This TT RS can hustle through corners like it is on rails, and even more so if fitted with the optional sport suspension plus with adaptive dampers featuring magnetic ride technology. Stopping over and over from high speed or quickly is also no problem thanks to massive ventilated and perforated brakes, and once again you can up the ante and spend some extra money on the optional lighter and particularly abrasion-resistant carbon-fibre ceramic discs. Inside it is all about the driver, with the controls and displays all being completely focused on the person behind the wheel, that now mimics the R8 layout of having satellite controls for turning the engine on and off as well as the Audi drive select dynamic handling system added to the wheel, in addition to the multifunction buttons. All information is displayed as standard on the fully digital Audi virtual cockpit with 12.3-inch screen, and you can choose from three views, including a special RS screen that highlights the tachometer and provides information on tyre pressure, torque and g-force, among other things. The tachometer also serves as a shift indicator. It will come as no surprise, that’s where I left my view for the test duration. And although Audi say it’s a sports car with a high level of everyday usability, and the luggage compartment offers a basic capacity of 305 litres which can be increased to 712 litres by folding down the rear seat backs, you won’t put any normal sized humans in the back or lug the family’s luggage anywhere with it. This car is about you, and maybe your passenger of choice, and it is all about having fast fun, in a dynamic and compact package, finished with premium quality materials. The Audi TT RS Coupe is priced at R963 000, standard with a fiveyear/100 000km Audi Freeway Plan and is exclusively available at Audi Sport dealerships.